Ingredients: Water sufficient for processing, tuna, soybean oil, tricalcium phosphate, carrageenan, cassia gum, guar gum, sodium tripolyphosphate, potassium chloride, glycine, disodium edta, natural flavor, dl-alpha tocopherol acetate, thiamine mononitrate, pyridoxine hydrochloride, riboflavin supplement, folic acid, sodium nitrite, manganese sulfate, zinc sulfate, BHA/BHT. Whiskas Purrfectly Fish Tuna Entree is formulated to meet the nutritional levels established by the AAFCO Cat Food Nutrient Profiles for the maintenance of adult cats. We'll begin this review of Whiskas Purrfectly Fish Tuna Entree with a detailed discussion of the ingredients. The second ingredient is tuna. Although tuna is an excellent protein source, raw tuna contains more than 60% moisture. After cooking, the relative meat contribution of tuna is dramatically reduced. Therefore, it's important to ensure that other meat sources are included within the first few ingredients to ensure the product derives most of its protein from meat. The third ingredient is soybean oil. Soybean oil is an omega-6 fatty acid source. Unlike other oils (flax, canola, etc), soybean oil does not provide omega-3 fatty acids; However, the balancing omega-3 fatty acids are most likely supplied by another oil or fat source in the product. The fourth ingredient is tricalcium phosphate. Tricalcium phosphate is typically used for its mineral contents. However, it can also be used to evenly disperse fat in wet food products. The fifth ingredient is carrageenan. Carrageenan is a substance extracted from edible seaweeds. Carrageenan is typically used for its thickening and emulsifying properties. 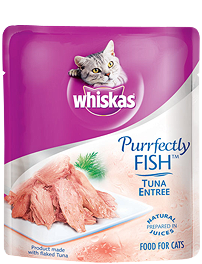 Because ingredients are listed in order of pre-cooked weight, the remaining ingredients in Whiskas Purrfectly Fish Tuna Entree are not as important as the first five ingredients. Next we have cassia gum. Cassia gum is made from the endosperm of a legume called senna obtusifolia. It's commonly used as a thickener and gelling agent in pet food. The next ingredient is guar gum. Guar gum (or guaran) is obtained from guar beans which have been dehusked, milled and screened. It's commonly used in wet food products as a thickening agent and provides a notable amount of dietary fiber. The remaining ingredients in this Whiskas Purrfectly Fish recipe are unlikely to affect the overall rating of the product. The official PawDiet rating for Whiskas Purrfectly Fish Tuna Entree is 3.0 out of 5.